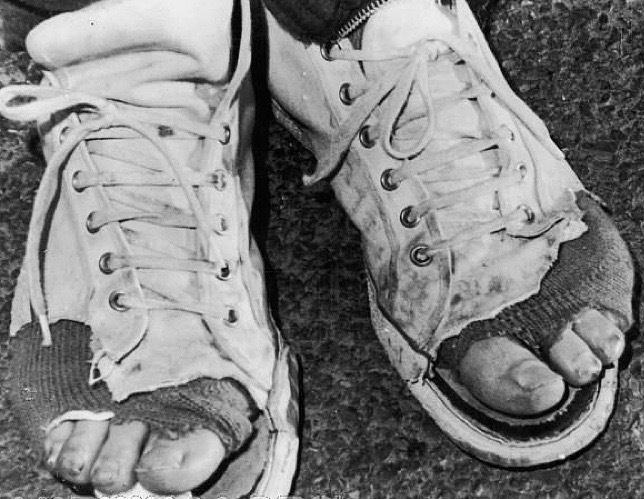 Once a quarter, 33 The Ministry travel into the homeless camps in the area giving away shoes, blankets and other items. After being made aware of homeless people that were walking the streets with holes in their shoes and spending time in prayer to see where God was leading this ministry, the vision was received to give a hand up to people that need assistance. Our first giveaway was on November 1, 2014. We gave away 123 pairs of shoes, 113 blankets and numerous pairs of socks and gloves. To date we have given away 327 pairs of shoes, 221 blankets, 134 stocking caps, 122 pairs of gloves, 40 bibles, 2 tents, 69 tarps, 31 bus passes, 175 pairs of socks, 20 bags of hygiene products and have prayed specific prayers with 243 people. We have ministered to 235 homeless men, 101 homeless women and 2 homeless children. One young man came to the give away with duct tape on one boot and the other was so worn that his foot was touching the ground through the sole. As he was given a new pair of shoes he began to cry and said that he could not believe that a stranger would do that for him. As he changed into his new shoes, you could see holes in his socks. After being offered new socks, he first refused them and said to give them to someone that needed them. After being offered socks a second time and assured that there were plenty for other people, he accepted them, said thank you, gave a hug and left. This is just one story of many from that giveaway. We are accepting donations of new and slightly worn shoes, blankets tarps and other items. These items can be dropped off at the Longview Dream Center located at 803 Gilmer Road in Longview. Monetary donations can be made at Go Fund Me (http://www.gofundme.com/bp7zfw).